I think the most significant danger church kids face is false assurance of salvation—assuming we are saved even when we are not. 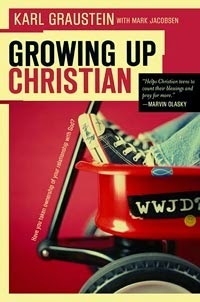 We grow up in a Christian culture with Christians all around us—family, church, and friends. Because we do the things Christians do and we are surrounded by Christians, we tend to assume we are Christians too. But just as standing in a wheat field doesn’t make someone wheat, being raised in a Christian environment doesn’t make someone a Christian. We tend to believe we are Christians because . . .
What gives you confidence that you are a Christian? The list above refers primarily to external actions. Each could in fact be a fruit of salvation—a good work or action of a believer. But each could also be nothing more than an unbeliever conforming to his environment (to please parents, fit in with peers, etc.) while there is no saving faith in his heart. Don’t fall into the dangerous trap of false assurance. Take some time to examine your relationship with God. Search your heart. Pray. Don’t make the mistake of basing your salvation upon what you do or your environment. Genuine salvation is a matter of the heart. It is based on faith alone—faith in God’s character, his promises, and the work of his Son on the cross. To do this we need to look at our actions, our motives, and the fruit in our lives. We need to pray, read the Bible, worship God, attend church, and confess sin. But it is possible to do all of these things and not be motivated from a heart that truly loves God and wants to live for him. There is a difference between saying a simply prayer over a meal and communing with your Lord and talking with your Heavenly Father. There is a difference between reading the Bible just like any other book and reading it as the genuine words of God which breath life and give clear direction to our lives. There is a difference between singing a song and truly worshiping your Sovereign Lord. When you look at your actions, the motives behind your actions, and the fruit of your actions, what do you learn about your heart? Have you every asked one of your parents their thoughts? How about a friend whom you respect? If you are saved, I hope this self-examination increases your faith all the more. God is at work in your life and will continue to help you grow in him. If you are not saved, I want to urge you to pause and pray. Ask Christ to make himself real to you. Ask him to be Lord of your life, transform your heart, and enable you to live all out for him. This is a prayer he is eager to answer. What a shame it would be for someone to grow up in a Christian home, attend church his whole life, assume he was a Christian, and yet not truly be saved. Sadly, this happens more often than we would like. Don’t let this happen to you.